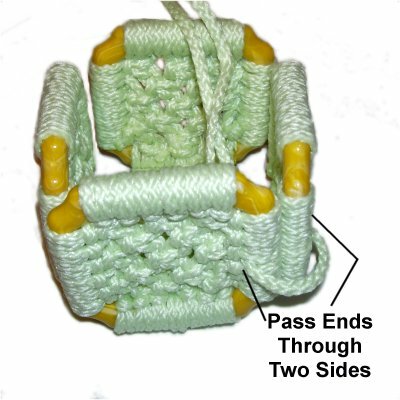 Description: The Macrame Container features the use of either regular plastic squares or contoured ones, as in the example. When this decorative box is completed, the size is 4 inches wide and 3.5 inches tall. It's perfect for holding small potted plants or household items. The sides of the box are tied together with shoe tie bows. This can be changed if you prefer something else. 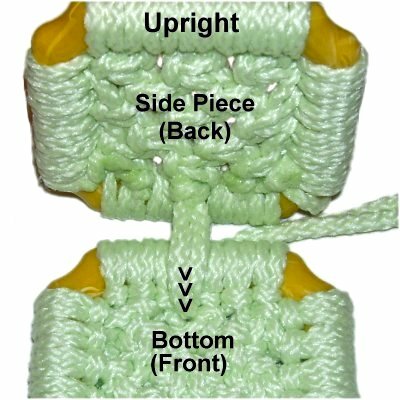 The Macrame design is made with Square Knots and Larks Heads, which are both basic knotting techniques. For that reason, this is a great project for beginners. Make sure you know how to tie all the knots in the list below. 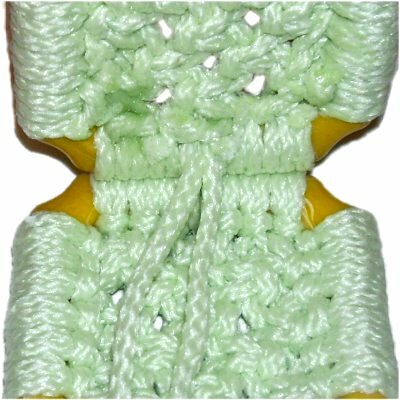 Squares are sometimes hard to find, so please visit our Acajou Crafts store, by clicking on the green banner to the left. 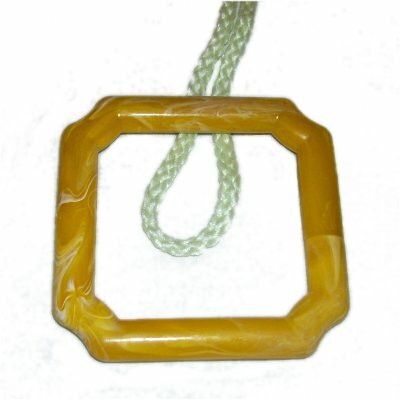 The same contoured squares you see in use here are in the Macrame supply section, on the same page as the rings. 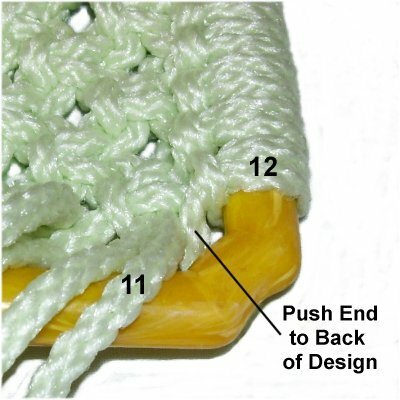 Each piece of the Macrame Container is made following steps 1 - 13. It's best to cut the cords prior to making each piece. Prepare the tips of the cords to prevent unraveling -- tape works well. << Fold one of the 45-inch cords in half and place it under the top portion of one square. Mount the remaining cords in the same manner, to the right of the one you just mounted. The next one should be a 36-inch cord, followed by three more of that size. The cord furthest to the right needs to be the other 45-inch cord. Step 2: Mentally number the cords 1 - 12. Tie a Square knot with cords 1 - 4, another with 5 - 8, and the third with 9 - 12. Tighten the SK as much as you can, so the Larks Head knots tighten around the square. Pull firmly on the fillers, too. 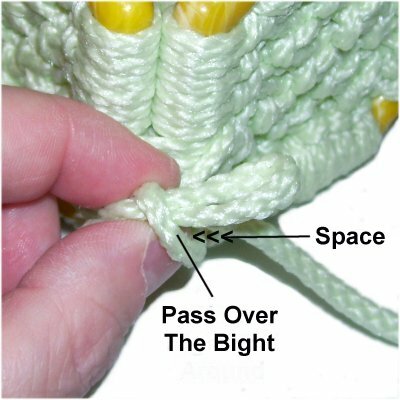 Design Tip: When tying the first few rows in each piece of the Macrame Container, the cords will have a tendency to sink downward, making tying awkward. Lift up the cords when tying the knots, so they don't rest on the board. They should be level with the surface of the square. Step 3: Move cords 1, 2, 11, and 12 to the sides. 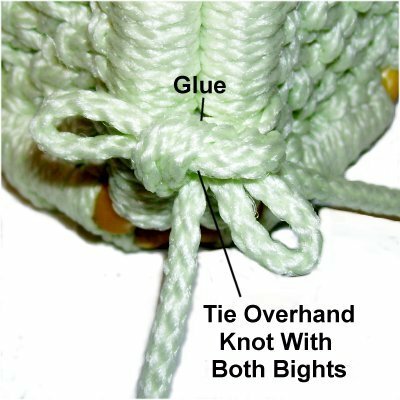 Tie a Square Knot with cords 3 - 6 and with 7 - 10. Step 4: Vertical Larks Head knots are used to cover the sides and bottom of the square. Pass cord 1 over - under the left side of the plastic square. Bring the end out above the loop, at the corner (clockwise loop). 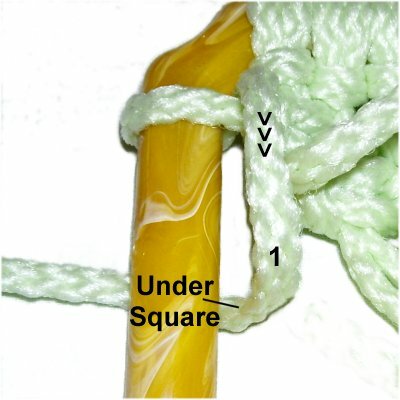 Pull cord 12 down towards the bottom of the square, then under the left side of the square. 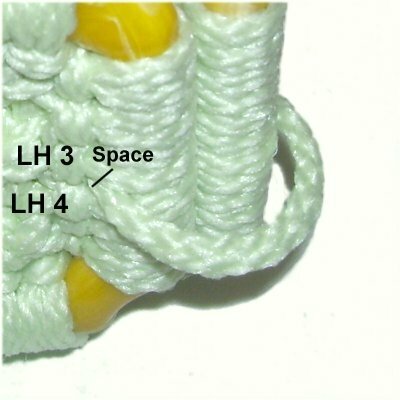 To complete the second loop for the Larks Head, move cord 12 to the right, over the frame. Pass it under the vertical portion you pulled towards you in the last step. 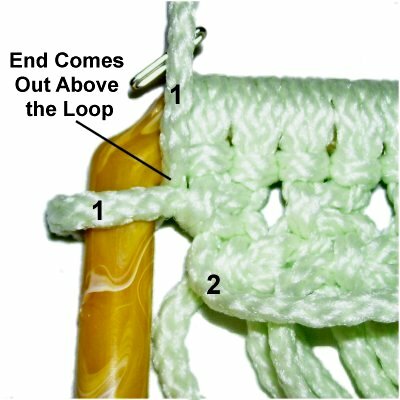 Tighten both loops as much as possible. 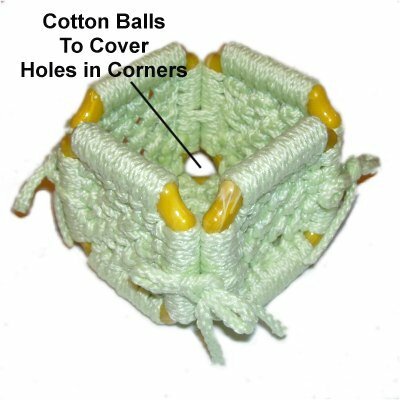 Design Tip: When using contoured squares to make your Macrame Container, the Larks Head knots can slip into the corner easily. So it's very important to tighten all the Larks Head knots as much as you can. 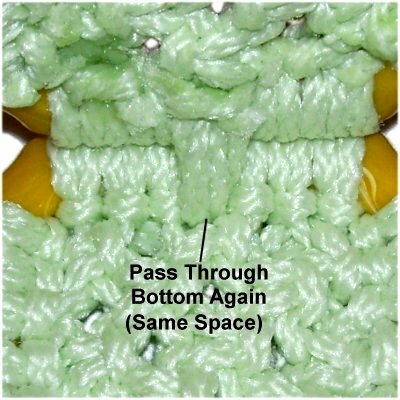 You can even add glue to help hold the knots in place. Step 5: Bring cord 1 straight down to the bottom of the square. 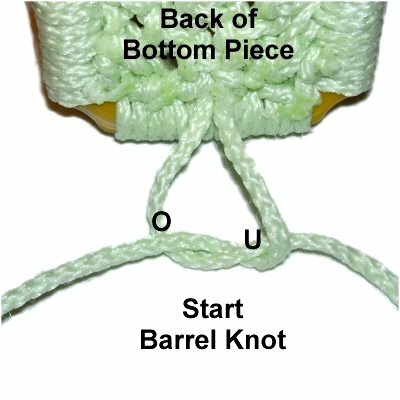 Repeat step 4 using cord 2. Be careful you do not go around cord 1 when you make the second loop. Step 6: Repeat step 4 using cord 12, tying the Larks Head knot onto the right side of the square. The only change is the direction (counter-clockwise). This image shows the first loop. 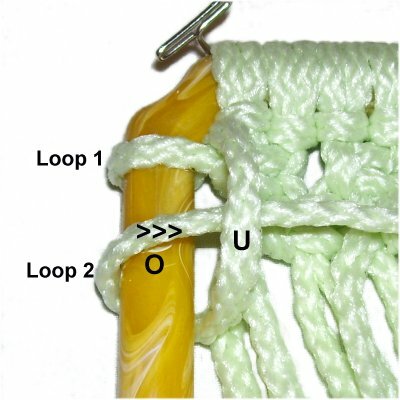 The second loop is tied by moving cord 12 down towards the bottom of the square. The bring it under - over the frame, and under the vertical portion of the cord. 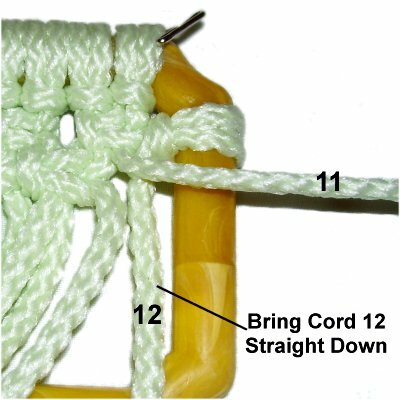 Step 7: Repeat step 5 with cord 11. Move cord 12 straight down before you get started, and don't go around it when you make the second loop. Step 8: Note that cords 1 and 2 have switched places. 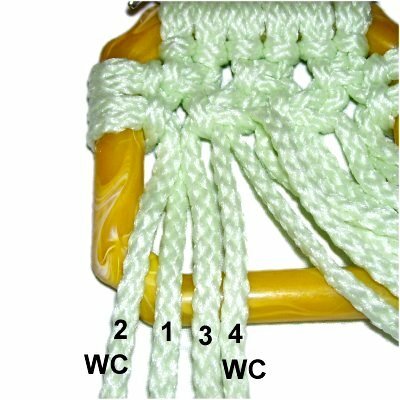 To start row 3, tie a Square Knot with cords 1 - 4, using cords 2 and 4 as the working cords. The fillers are cords 1 and 3. Tie a Square Knot with cords 5 - 8. 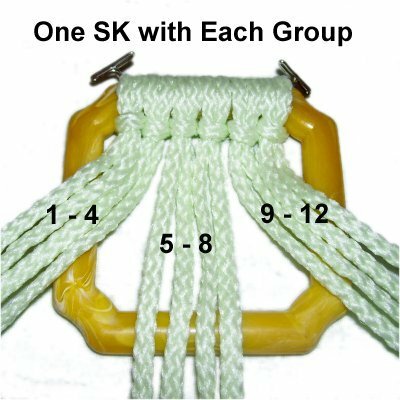 Tie the next SK with cords 9 - 12. Cords 11 and 12 have switched places, so be sure to use 9 and 11 as the working cords. Step 9: Mentally re-number the cords. Repeat steps 3 - 7, tying the 4th row of Square Knots, along with the next pair of Larks Heads on each side. 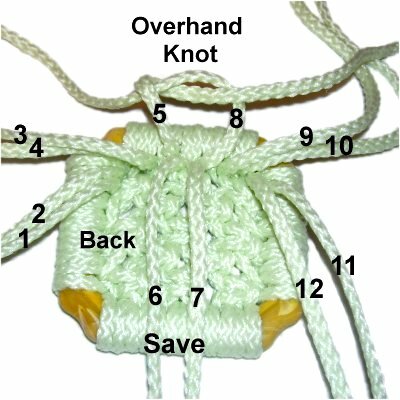 Repeat step 8 to tie the 5th row of Square Knots for your Macrame Container. 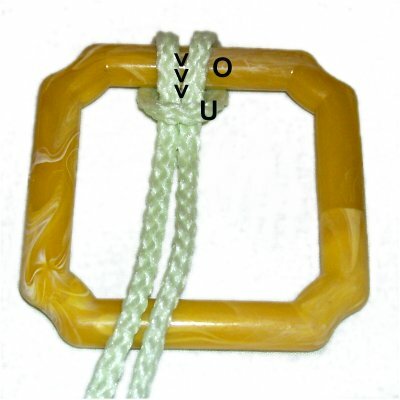 Push cords 6 - 7 to the back of the Square Knot design, since you do not use them for the next steps. Step 11: Repeat steps 4 - 7, attaching cords 1 - 2, along with cords 11 - 12, to the sides of the square. 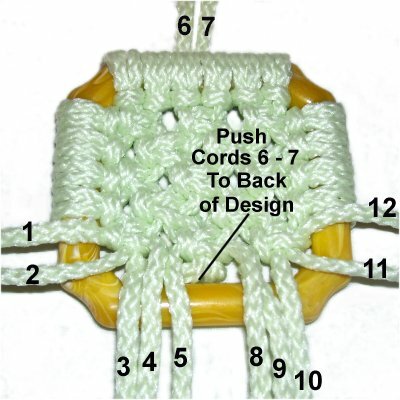 After you attach each cord, push the end to the back of the design, where it will be tied off. 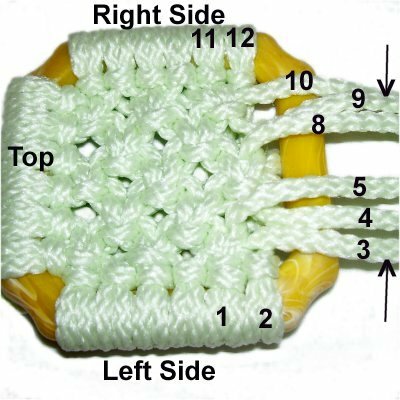 Step 12: Turn this piece of the Macrame Container so the top is on your left. Attach cords 10 - 8 to the bottom of the square, with Larks Head knots. Then turn the whole square around so the top is on your right. Attach cords 3 - 5 to the bottom. In other words, work from the corners towards the center of the square. Design Tip: You may need to stretch the SK design to bring it closer to the bottom of the square. Step 13: Turn over the design so you are working in the back. 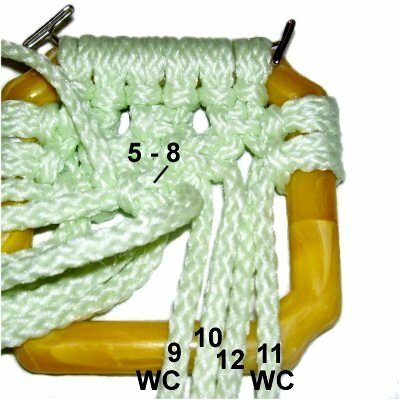 Do not finish off cords 6 - 7, since they are used to construct the Macrame Box. 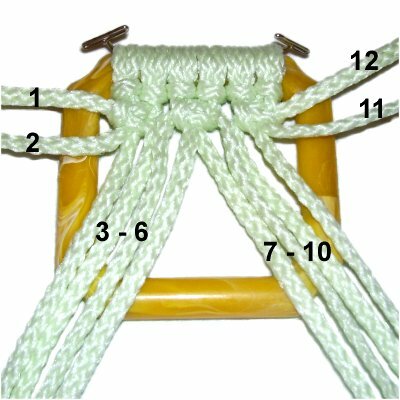 Tie Overhand knots with the remaining cords, in sets of two. 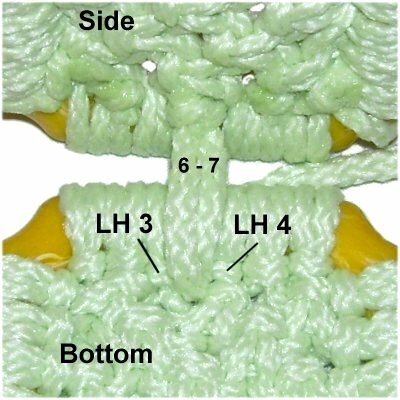 Apply glue as you tighten each knot. 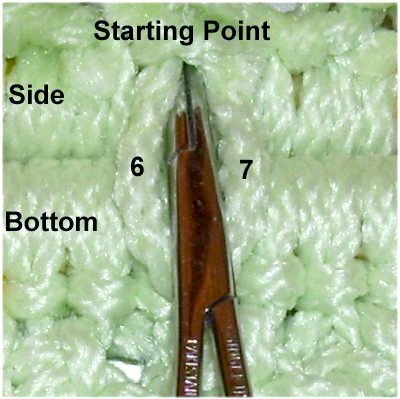 Cut off the excess material when the glue is dry, and melt the tips if using Bonnie Braid or nylon. Step 14: Repeat steps 1 - 13 four times, to make the other pieces for the Macrame Container. Choose one square for the bottom. When you get to step 13, finish off ALL the cords, including 6 - 7. Step 15: Now it's time to construct the Macrame Container. The back of each piece is the surface where you finished off the cords. For the side pieces, make sure the area where you tied off is at the bottom, since that's where cords 6 - 7 will be. Place the bottom piece flat on your board, with the FRONT face up. Place a side piece next to it, holding it upright. The BACK of the piece should be facing you, so it's on the inside of the box. Place pins behind the side piece for support. << There are six Larks Head knots on each area of the square. Find the space between knots 3 and 4 on the bottom piece. Slide cords 6 and 7 (from the side piece) through that space. << Bring cords 6 - 7 through the side piece from outside to inside. The best space to pull them through is between the two cords, just below their starting point on the square. Step 15, continued: Pull firmly on the two cords. Lift the bottom area of the side piece so it rests on top of the bottom piece, and pull them again. 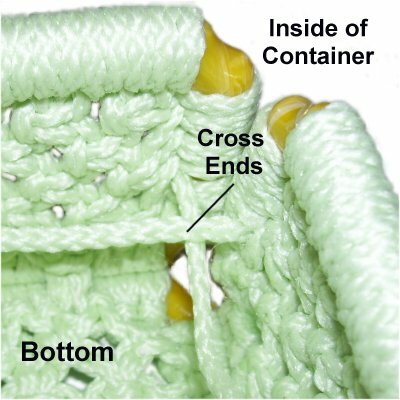 The bottom area of the Macrame Container needs to be as tight as possible, and lifting will increase the tension. You will move the side piece down slightly later. Pass the two cords through the bottom piece again, through the same space they went through the first time. 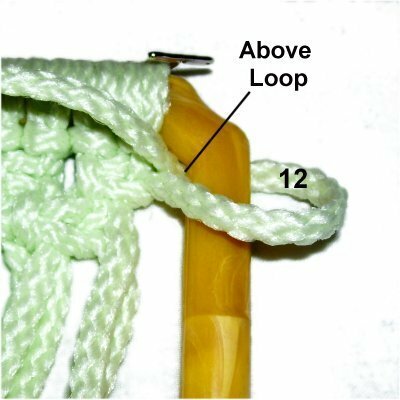 Step 16: Turn over this portion of the Macrame Container so you are working in the back of the bottom piece, where cords 6 and 7 are dangling. This was the area resting on the board. 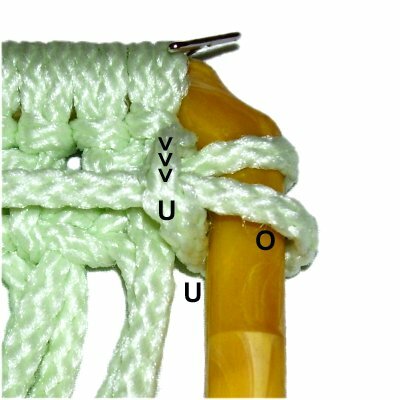 << Pass the cord on the right under - over the one on the left (Overhand knot). 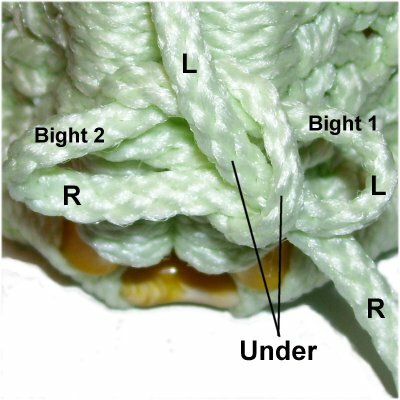 Pull both ends gradually, tightening the knot as much as possible. Step 17: Repeat Steps 15 and 16 to attach the other three side pieces to the bottom piece. When you get to the end of step 15, you may need to move the side pieces down slightly. Just re-arrange the pieces so they all line up evenly. Step 18: Now it's time to connect the sides of the Macrame Container. The instructions below are for one area. Cut 1 cord (or use scrap), at least 25 inches long. << Fold one in half and pass the two ends through openings in two side pieces (outside to inside). The best place is the area between Larks Head knots 3 and 4. Match the two halves so the cord is balanced. Cross the two ends on the inside of the box. Bring the ends to the outside again, through the same openings they went through before (on opposite sides, since they are crossed). Pull them tightly, so everything holds together. The next step is to make a bow, but if you prefer something else, skip past step 19. 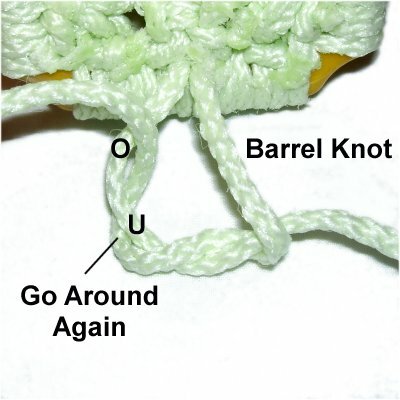 Step 19: To start the bow on one corner of the Macrame Container, tie a very tight Overhand knot with the two ends. 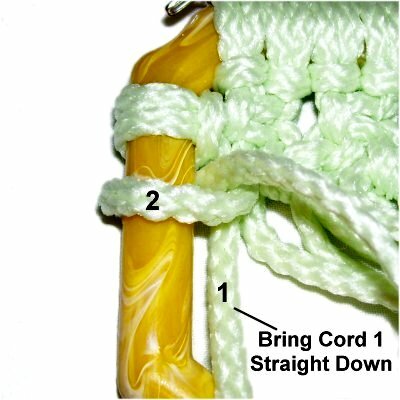 Fold the left half of the cord to form a bight. It should be arranged sideways, heading right. 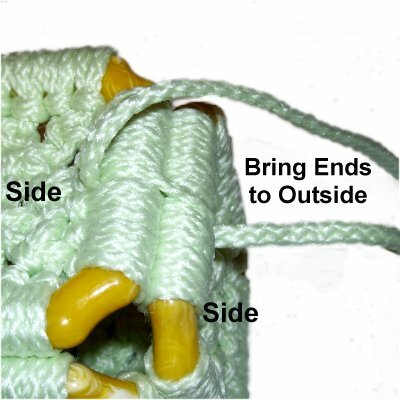 Bring the right half towards you, then over the bight, heading towards the Macrame Container. Leave a little space below this loop (arrows <<<). 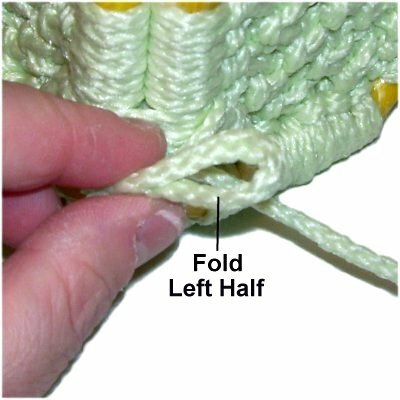 Fold the right half to form a bight, and push it under the loop made in the previous step, via the space you left for it. Make sure this takes place under the left half of the cord. Pull both bights to tighten the bow. 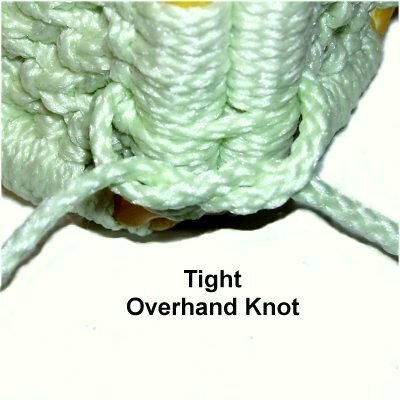 Tie an Overhand knot with both bights, and tighten firmly. Apply glue behind the knot, and push the bow back to rest against the box. Use masking tape to hold it in place while the glue dries. Step 20: Repeat steps 18 and 19 to connect the other three sides of the Macrame Container. Adjust the squares as needed so all four sides are the same height, BEFORE you tie the bows in step 19. Use cotton balls to cover the holes in the corners if you plan to place small items in the container. 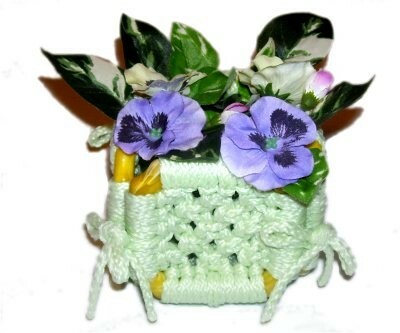 Have any comments about the Macrame Container? Contact Me.